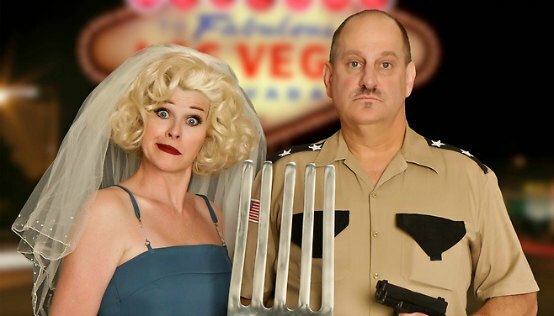 Marriage Can Be Murder Las Vegas is the longest running interactive murder/comedy mystery dinner show in the city. Beginning in 1999 this hilarious show of wit and intrigue will have you thinking you are a pawn in a real life game of Clue. Currently the show is performing at The D Las Vegas (formerly the Fitzgerald’s Hotel and Casino) which is a perfect place for this outstanding two hour dinner show. Marriage Can Be Murder is a wonderful and witty dinner show comedy that is filled with murder mystery. The writers of this show, who are actors and directors too, have really gone out of their way to make this show an interactive event with the audience. Many of the actors are planted in the unsuspecting audience to enhance the overall experience of the show’s unique qualities of comedy, mystery and murder. Guests that show up early are included most often in the four murder mystery skits that will be performed during the dinner show. Guests might be asked to be a judge, a doctor, a coroner or even perhaps a pallbearer. Each new episode brings new actors from the audience, so no one ever really knows what is happening next. Marriage Can Be Murder is a dinner show for most ages. The show is tasteful in nature as too is the dinner. Once you arrive at your table you will be amazed at the crisp salad and warm dinner rolls served in a banquet style for the whole table. For your main course you will have a choice of a chicken, meat or vegetarian selection as well. Dessert will offer something that will satisfy everyone’s sweet tooth. As you dine you will be entertained by DD and Lt. Post who will intertwine a standup comedy act that is sure to please your pallet too. DD is a wonderful host during the whole show and is punctual with her fantastic one line jokes. She will walk you through the events of each murder in a witty and distinguished attitude at times. Lt. Post will certainly detail the facts and only the facts for you to decide who the victim, murderer and motive for each episode. Patrons are asked to fill out a card with their respective thoughts on who done it, why and who got murdered. After each skit the audience has time to prepare for the next challenge of intrigue. The evening ends when all of our murder mysteries have been solved and everyone is still accounted for in the audience. DD and Lt. Post are the perfect couple to pull off one of the funniest nights you might have in Las Vegas. The cast of this wonderful dinner mystery show have had a very diverse life as well as actual husband and wife team. Eric and Jayne Post have teamed together in acting, directing and writing interactive comedy/mystery shows for over 23 years. Eric Post aka Lt. Post is a former Lieutenant in the U.S. Navy for over ten years before earning his degree in acting from the California Institute of the Arts. He has performed in an episode of Magnum PI, the movie Quake and was even the official Caesar at Caesars Palace in Lake Tahoe. Eric is also a graduate of the Le Cordon Bleu Culinary Institute and has a cooking show on YouTube. Jayne Ann Savoie Post aka DD was born and raised in Montreal, Quebec before moving to California in the 1980s. Since her move she performed stand-up comedy at a variety of places such as The Comedy Store and The Holy City Zoo. DD has been involved in murder mystery comedy for over two decades beginning in the 1990s when she and her husband Lt. Post began acting, directing and writing for their own creation, Marriage Can Be Murder in Sacramento, California. Marriage Can Be Murder Las Vegas is a two hour show that is being performed at The D Las Vegas Hotel and Casino (formerly Fitzgerald’s Hotel and Casino). This nightly show starts promptly at 6:15 P.M. Patrons are encouraged to lineup as early as 5:15 P.M. because the fun starts in line. The show is family oriented and children eight years of age or older can attend. Marriage Can Be Murder Tickets start at $70.00 for dinner and the show with VIP add-ons available that include a souvenir coffee cup as well as Marriage Can Be Murder t-shirt.